Recent release “Idyls at Sunday Creek” from Page Publishing author Diyo Boniface is the intriguing tale of an American gubernatorial candidate who runs afoul of the FBI and escapes to a small West African village. There he makes his fortune and becomes entangled in multiple love affairs. Diyo Boniface, a bilingual translator, teacher, and researcher, had completed his book “Idyls at Sunday Creek” prior to his death in 1998: a gripping tale involving an American named McCormick who flees to a small West African village, Sangari, after his gubernatorial bid is under investigation by the FBI. There he makes his fortune and becomes involved in multiple love affairs. Djyo Boniface was born in 1948 in the western region of Cameroon in central Africa. He went to high school at Lycee Joss in Douala and then to the University of Yaounde, where he majored in Lingustics (English and French). Being bilingual in a bilingual country brought a lot of opportunities to him. He was accepted to Uwist Cardiff (Wales), the University of Leeds (England) and even to the University of Sorbonne (France). He worked as a translator in the presidency of the Republic of Cameroon. After that, he chose to be a teacher; he was teacher in the bilingual grammar school of Buea (Cameroon). Before he passed in 1998, he was engaged in a research project of applying lingustics into anthropology. Published by New York City-based Page Publishing, Diyo Boniface’s intriguing tale is about an American, McCormick, who runs afoul of the FBI for attempting to create a constituency to back up his gubernatorial bid. He takes refuge in a small West African village called Sangari. There, he builds an inn, the Sunday Saloon. After an apparently good start, McCormick’s good fortune veers off course: his partner, a certain Lady Jane who was not his wife, runs away with another lover, his business fails, and his boat capsizes after hitting a tree and he dies. Prior to his death, he had become one of the highest dignitaries of the land, the priest of the Panther’s Sacred Cave, and had successfully negotiated a marriage to a girl named Cecilia with her family. After McCormick’s accident Cecelia’s aunt, Mammy Suzanne, arranges an elopement with a boy Cecelia wanted to marry. While the two leave Sangari for Bandoni, tragedy strikes when the canoe they are traveling in is caught in a storm. 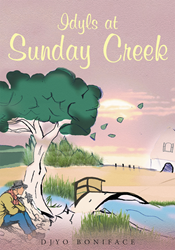 Readers who wish to experience this gripping work can purchase “Idyls at Sunday Creek” at bookstores everywhere, or online at the Apple iTunes store, Amazon, Google Play or Barnes and Noble.